On 8th February, we introduced school pupils from two Southwark schools, to top financial companies, at our first Careers In Numbers event. The event aimed to help schoolchildren aged 15-18 to feel inspired by careers at these companies, to learn about all the different roles people do within this sector, to discover all of the entry routes, as well as how to stand out when applying. 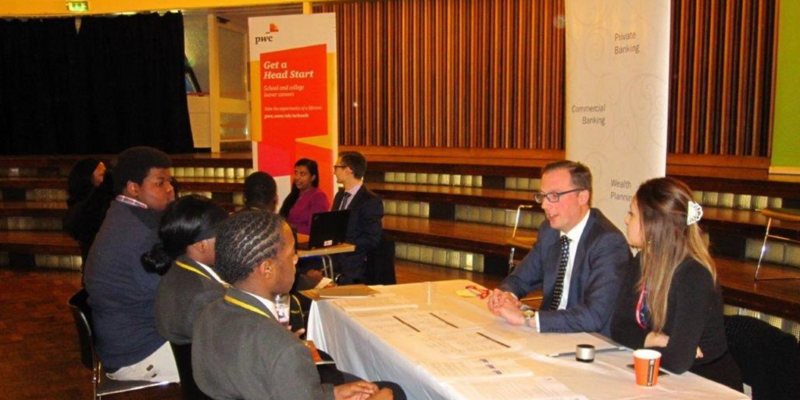 Pupils from Ark Globe and Ark Walworth academies, met staff from BNP Paribas, PwC, EY, Arbuthnot Latham and Coutts, where they were given the opportunity for meaningful interactions with the company representative, and quizzed them about what life is really like, working in numbers. Events like this are important, because not only do they help give pupils a valuable insight, but they also help prepare them for the intensive recruitment processes at these top firms, as well as encouraging them to aspire to work for them. We asked pupils if the event had given them an insight into the types of roles people do in these companies, and 72% reported that they had. Around half of the pupils we surveyed had also only heard of some, or none, of the companies who attended, and 52% said they would now consider applying to one of these firms as a direct result of attending Careers In Numbers. We plan to introduce more of these events – with a focus both on finance, and other sectors – to more London schoolchildren in 2018. If your company would like to meet and speak to talented pupils, we would invite you to get in touch to find out how you could attend.